As I was browsing Pinterest the other day I came across this photo. I think I let out an audible gasp. It’s a coat closet turned into a little mini library. Isn’t it gorgeous? 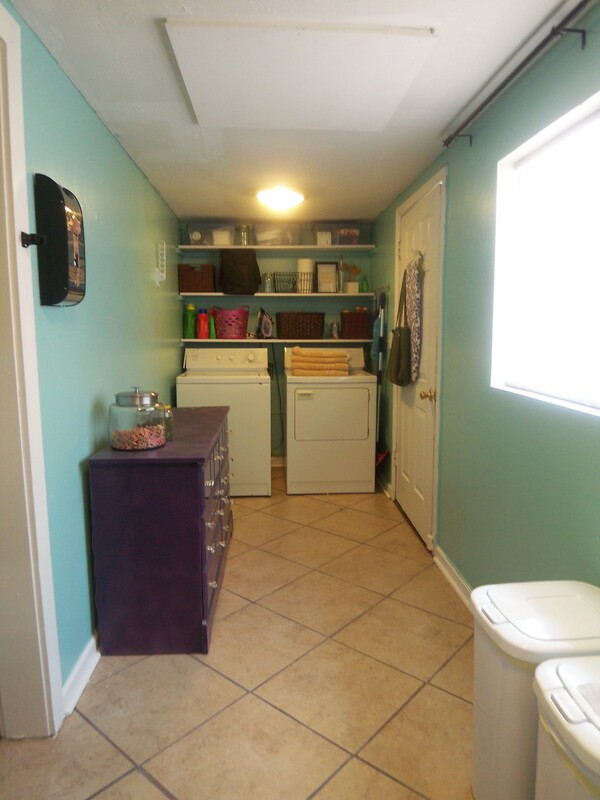 My mind immediately went to the long, skinny closet off our guest room that we currently use as a pantry/tool shed/attic. Floor to ceiling built-ins lining the left side, with shelves that reach between the studs to maximize the narrow space and cabinets along the bottom to provide some practical hidden storage. 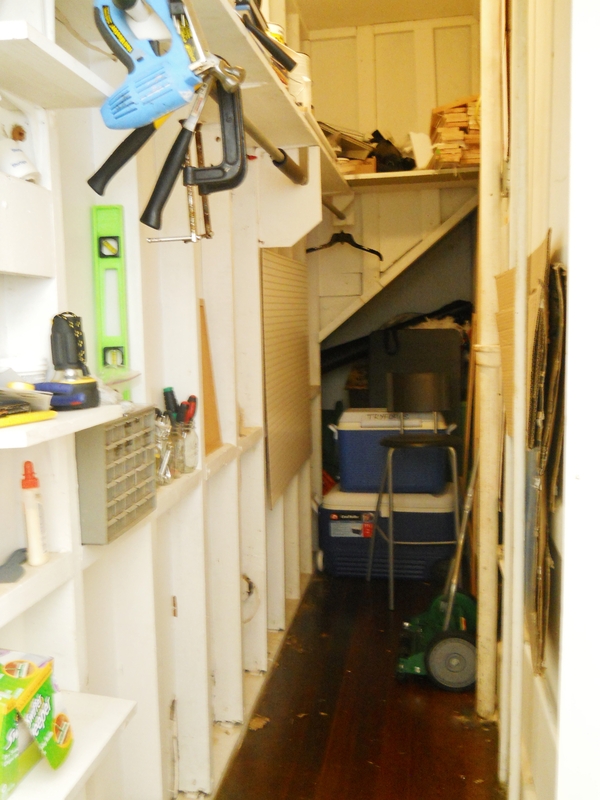 Eight inch deep shelves and cabinets would still leave 28″ of clearance for the walkway. I’m not familiar with the residential code for our area but google tells me that that meets the OSHA standard for public buildings. 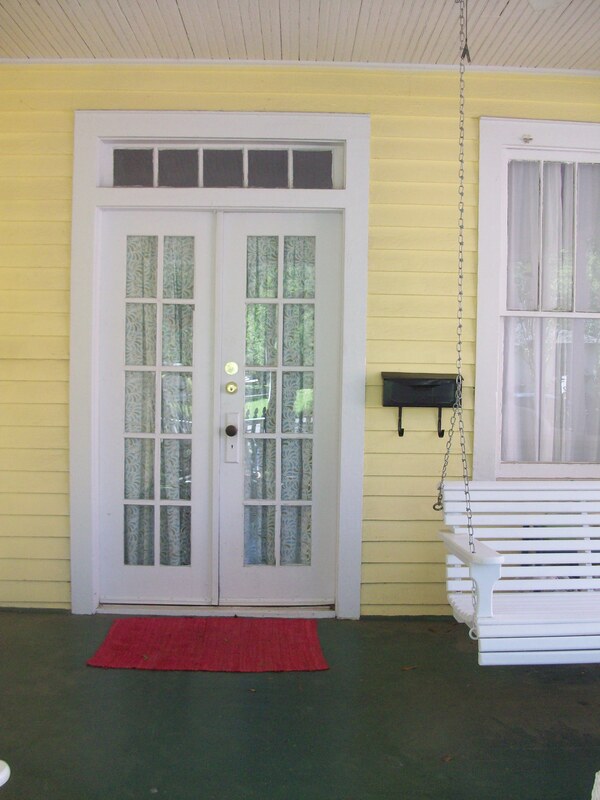 A glass-paned door at the entrance so you don’t feel like you’re locked in a closet. The door that’s there now is original to the house so I’d like to be able to reuse it elsewhere instead of throwing it out. 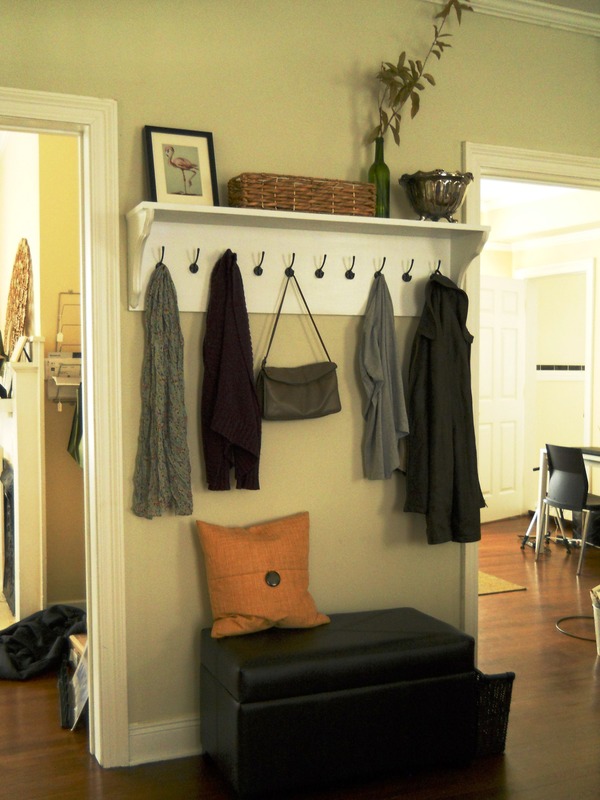 A built in bench at the back of the closet, where the space extends to the left underneath the stairs. 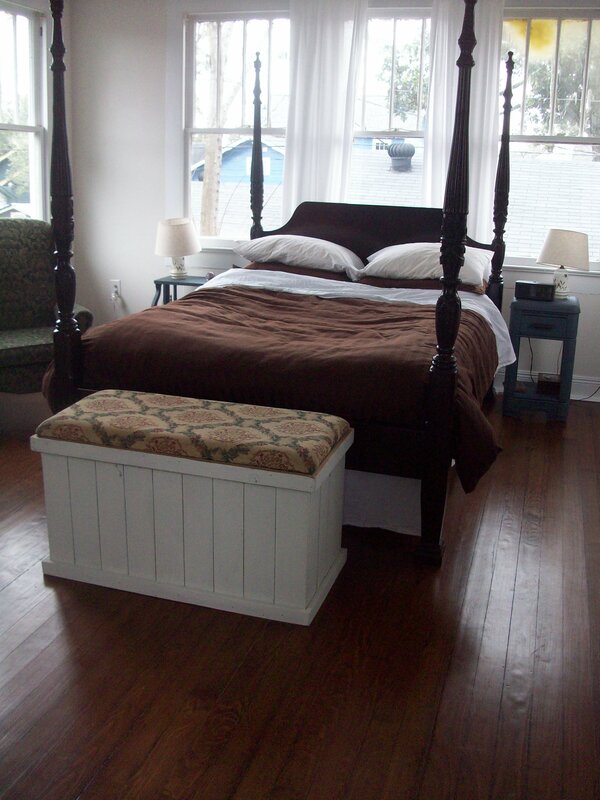 Maybe we could have cubbies underneath the bench to store extra blankets and pillows. And a little light above to make the perfect reading nook. It’s almost as deep as our Ektorp sofa and long enough for little ‘ol me to stretch out fully. Of course I’d need a way to reach those top shelves, but one of those fancy rolling library ladders is outside of even my fantasy budget. 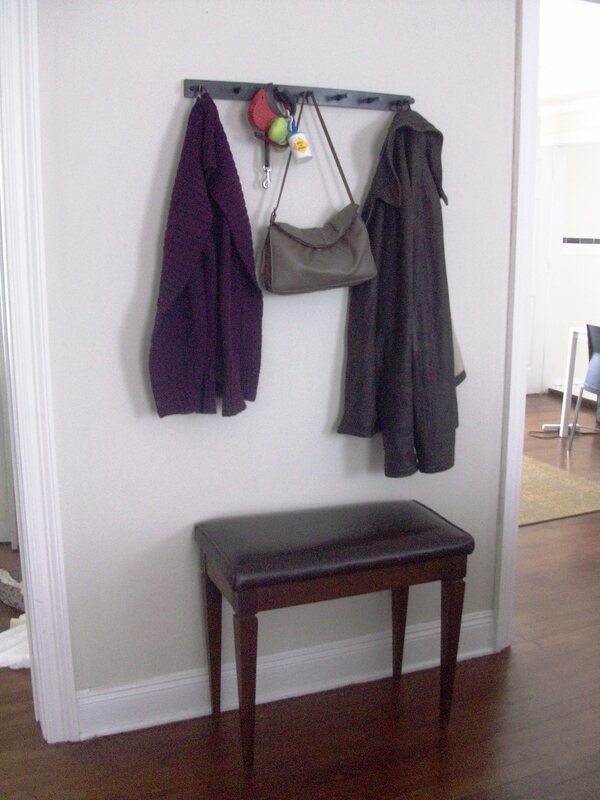 This stepstool is not too bad to look at and could hang unobtrusively on a hook on the wall. It’s quite dreary out today and I can’t help but daydream of curling up in a pile of pillows to read a good book in my little library. Of course that would require that I actually had time to read a book, haha. 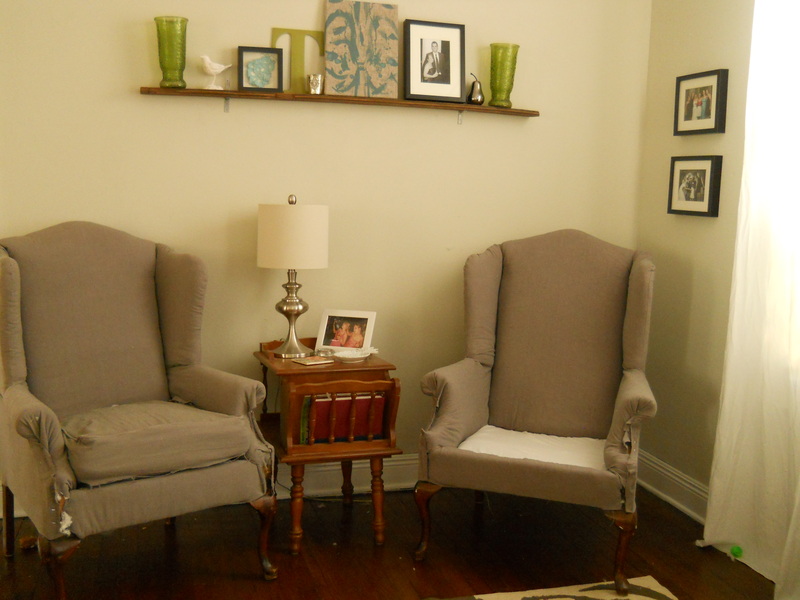 But seriously, how great would a space like this be to encourage a kid (or grownup) to read? What could be more fun than a reading nook that feels like a secret hiding spot? I remember hiding in my closet with a book trying to avoid having to do chores. I read all the time, so my mom had no qualms about telling me to put down that book and come wash some dishes. I hope this Monday morning is not treating you too badly. I had a looooong weekend of single parenthood while Nick was in Baltimore for a buddy’s wedding. I will not be agreeing to anything like that again for a long time. It was HARD being the only parent for eighty consecutive hours, even with a break to visit my inlaws for a few hours Saturday night. Next time maybe I’ll go to the wedding and leave Nick at home with a freezer of frozen milk, haha. How Many Pegs Can a Pegboard Peg? 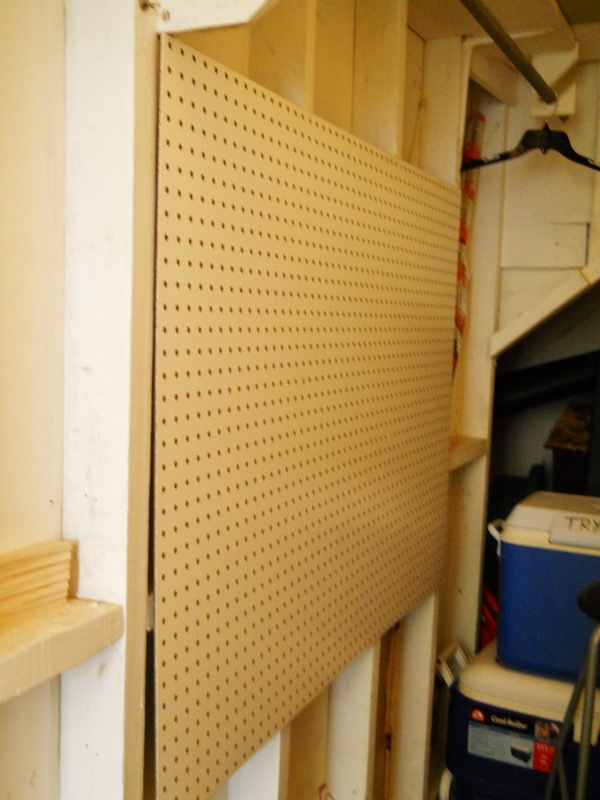 Really, how many pegboards do I need in my house? Answer: quite a few. Houses as old as mine weren’t exactly built with storage in mind. I guess folks in the twenties just didn’t have nearly so much stuff, and we modern residents have to get creative to keep things from getting too cluttered. So after we had a pegboard cut to size to address our storage problem in the office last week there was no way I was letting the 3′x4′ remnant go to waste. I had big plans for that sucker. In a cruel twist of irony our house actually has a huge closet that makes the other two (that’s right, only three closets total in this joint) look like shoeboxes. It’s unmanageably large, actually. And the long and narrow dimensions aren’t doing us any favors. As you can see, we pretty much rely on it to serve the functions of a shed, garage, and attic all in one, none of which we actually have. Technically, we do have an attic, but it’s not floored and the entrance is barely big enough to squeeze a person through, much less a bunch of stuff we want to store. So all the stuff that would go in an attic (or in some sort of utility storage like a garage or shed) gets tossed in here instead. 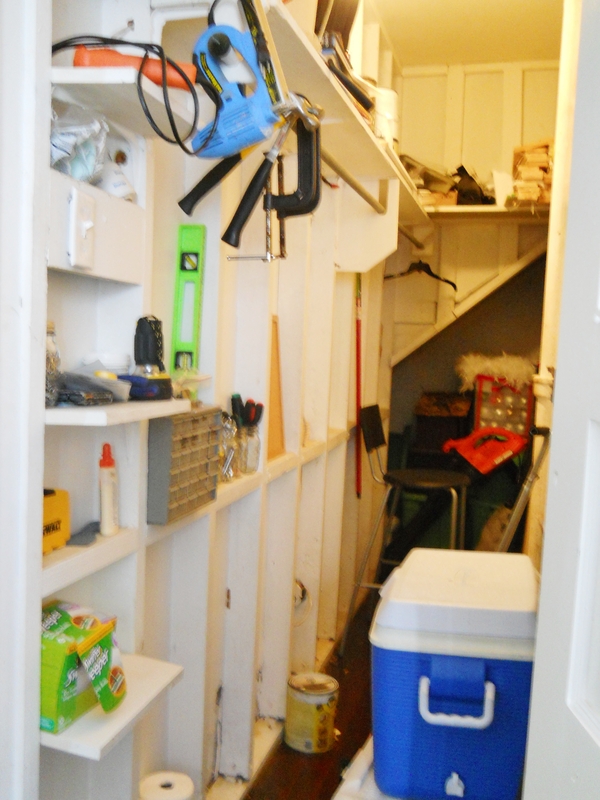 We’ve got rarely used items and Christmas decorations tucked up under the stairs, all of our tools perched in the spaces between the studs, paint cans and random crap lining the top shelf, and spare lumber piled up near the back. Some people who live here have a bad habit of leaving the most recently used items near the entrance, though don’t ask me what the ice chests are doing there because we haven’t used them since last summer. 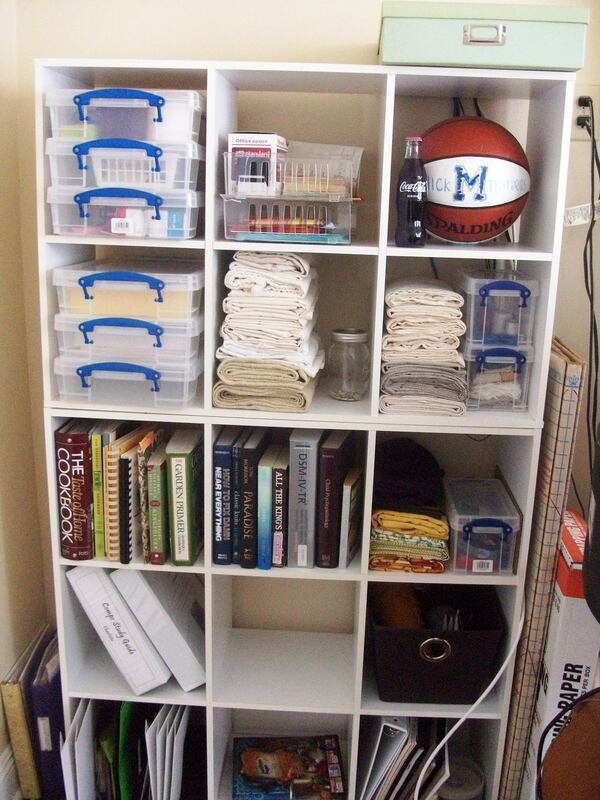 This closet has some big organizational problems. Bigger than I was willing to tackle on this particular day. 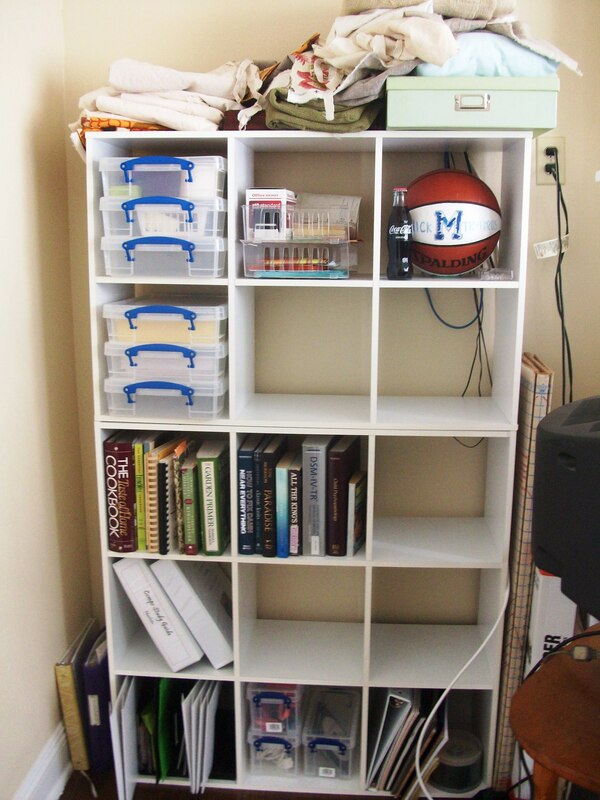 But I was willing to take one small step: I was going to hang up that piece of pegboard. 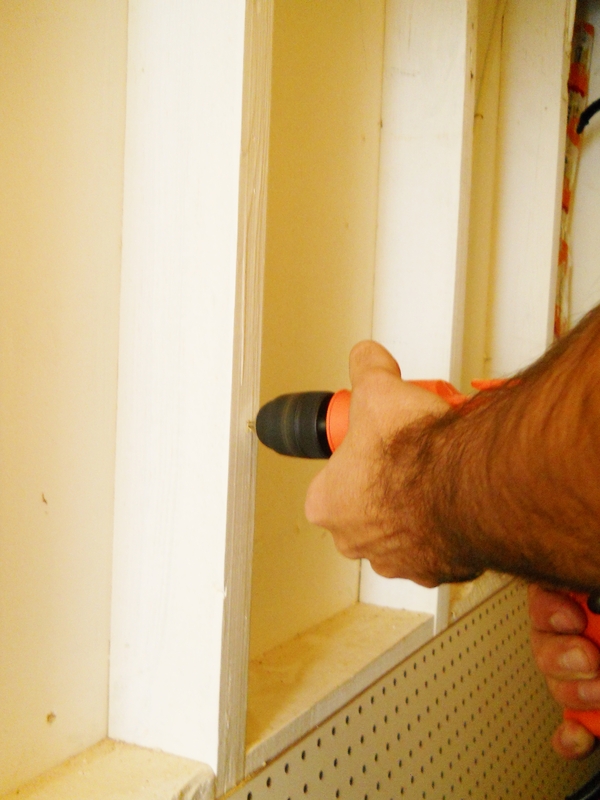 I marked out where I wanted it to go and Nick drilled holes for it right into the studs. We didn’t need to attach small pieces of wood behind it like a pegboard usually requires since the studs were exposed like this. Very convenient. Then we screwed it into the wall. Easy peasy. 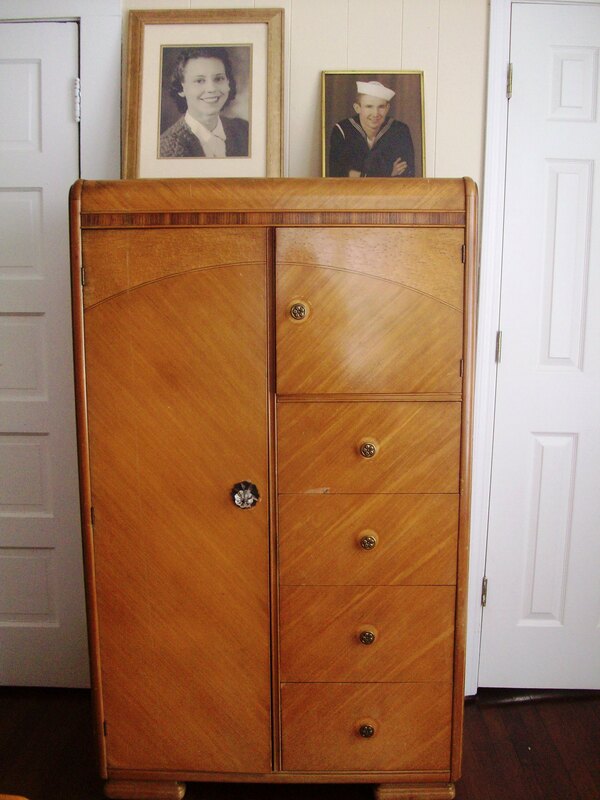 While I had Nick handy I had him move some things around so there wasn’t such a logjam at the front of the closet. The big stuff got pushed to the back so it was still accessible but out of the way. The barstool, in case you’re wondering, is what I use to climb up and access the top shelf. I’m not quite as spritely in my pregnant state and have recently started abiding by a self-imposed ban on climbing up on things, but I don’t have anywhere else to put the barstool anyway, so it stays. Maybe I’ll find myself standing on it again in another six months or so. We just attached the pegboard to those three studs furthest from the camera. It wasn’t quite long enough to stretch across all four studs so we had to choose one or the other, and I was thinking the further back in the closet it was the better. I suppose I could have scooched it over a bit more so that it was centered across those three studs, but I didn’t. 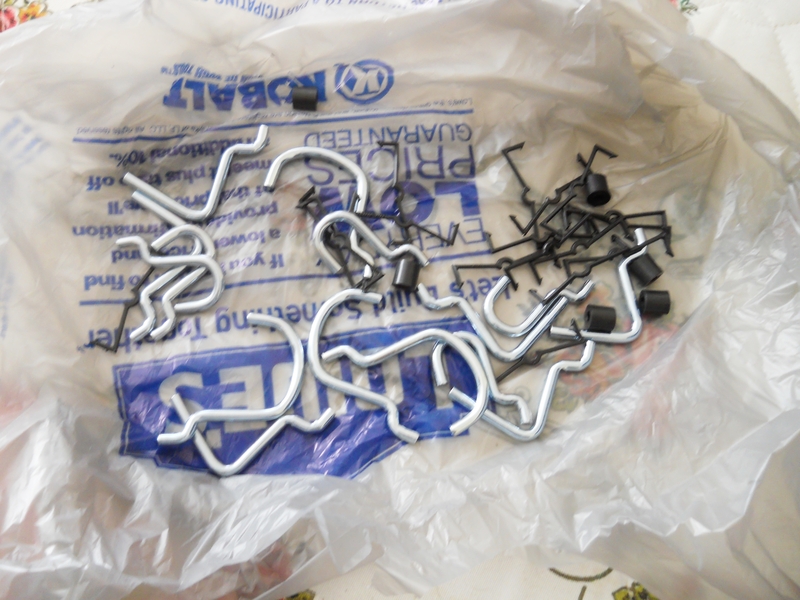 I picked up this assortment of pegboard accessories at Lowe’s last week for about $7. It was kind of hard to tell what it all was poured out like this, though. 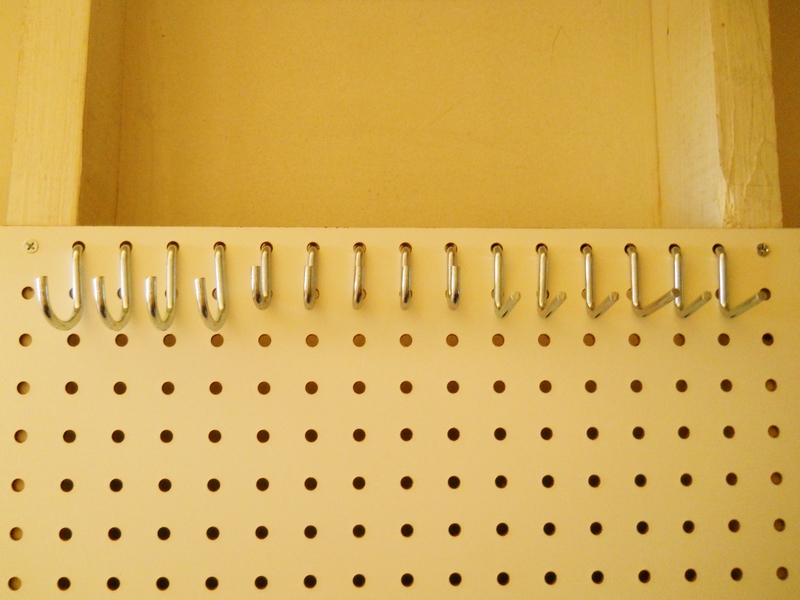 I remember from the pegboard at my old house that those black things are to help secure the hooks to the board, but I always found them kind of useless. 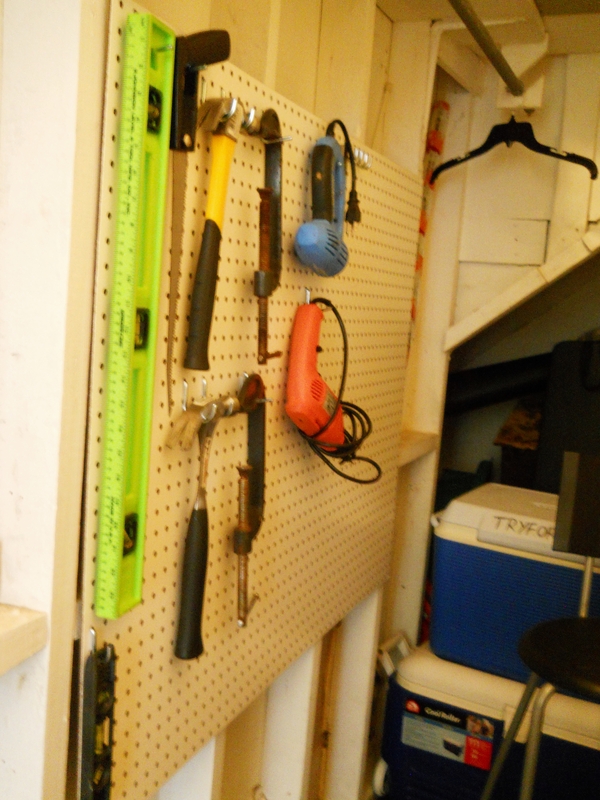 I decided to hang all the hooks up on the pegboard so I could see what I was working with. Then I got started hanging my stuff up. 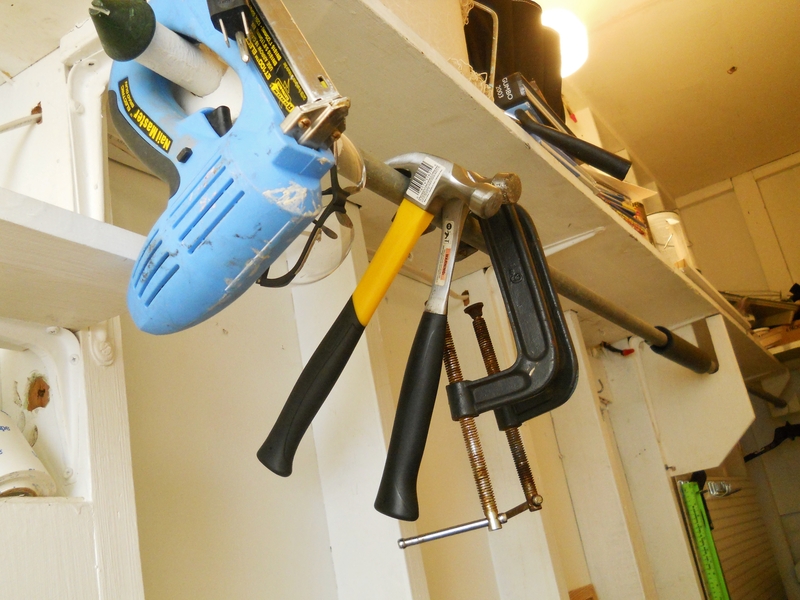 These heavy, dangerous, precariously perched tools were pretty high on the priority list. Ta-da! I feel much safer and less stressed walking into this place now. Look how nice and neat everything is! Y’all just have no idea how happy this makes me. It’s like a little organization island in a sea of chaos. 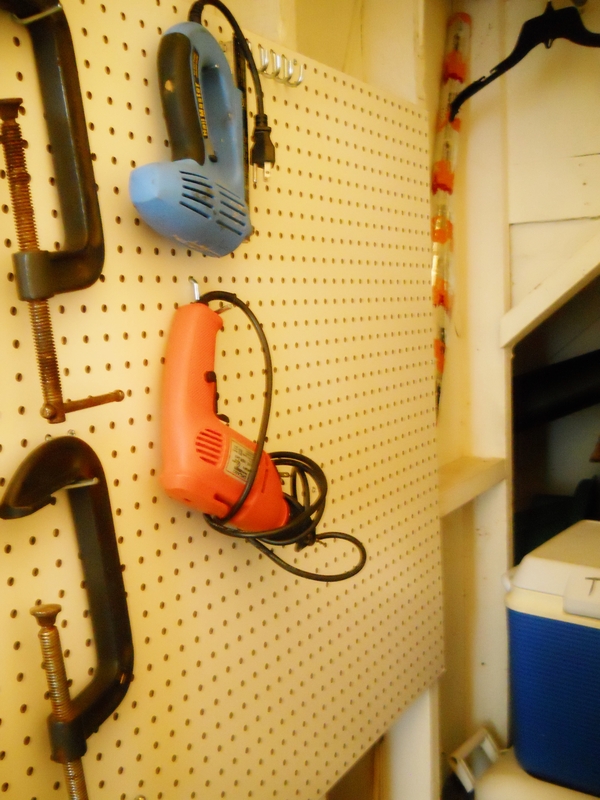 There’s still a lot of empty space on the far side of the pegboard, but all I’ve got left is small hooks. What I really think I need next is some hanging baskets and bins for all the small stuff, and maybe some sort of contraption to hang screwdrivers and pliers and whatnot. 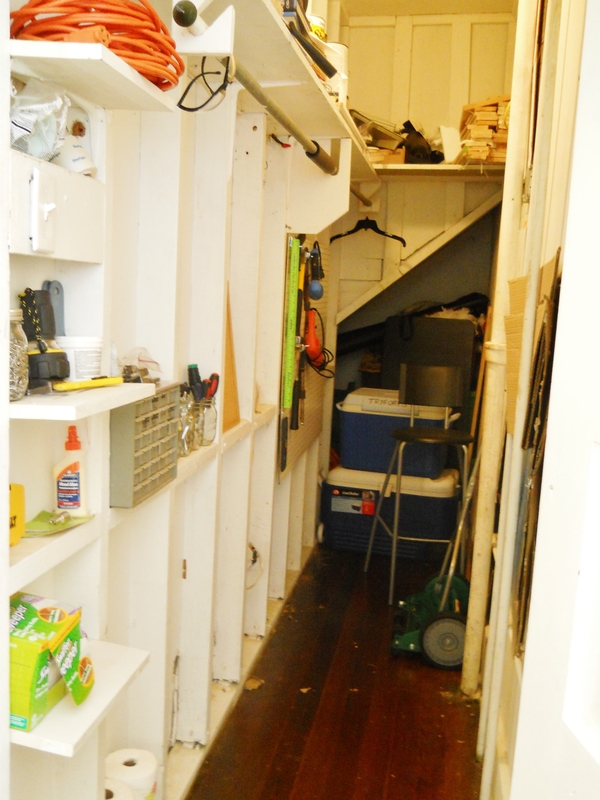 There’s still a ton to be done in this closet, not the least of which is some serious purging. But I’m taking babysteps, people. Babysteps. When I first started blogging, I thought maybe it would be fun to document and show off all the home decor and crafty projects I ‘d be doing anyway. I had no idea that my little project-completing engine would be hurled into overdrive. I’m so motivated by the desire to always have more new and interesting projects to share with y’all! I’m awestruck when I think about how many projects I’ve tackled just since I started blogging. 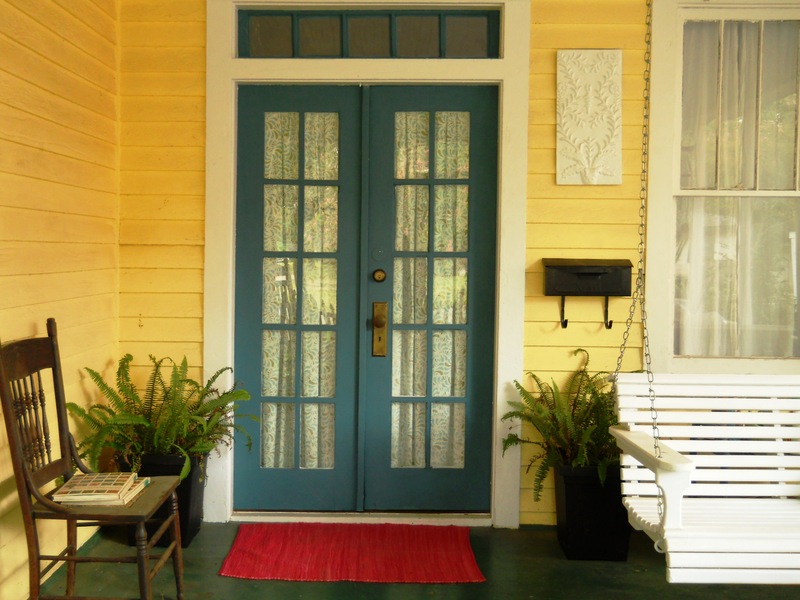 Can you believe that this was my entryway for the first year that we lived in this house? 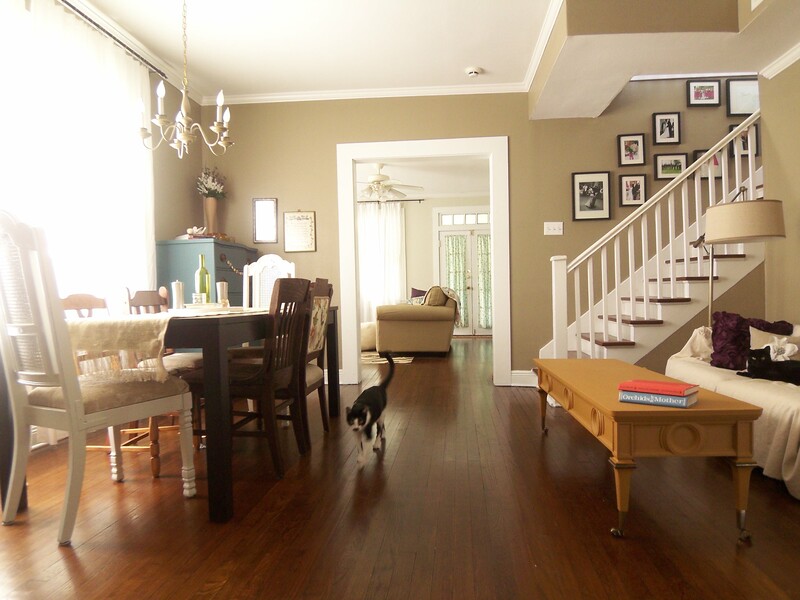 The dining room isn’t quite as dramatic, probably because I’d already brought in the dropcloth slipcovered sofa, leaning bookshelf, blue painted dresser, and floating wall shelves before I started blogging. But even with all that work already done I’ve tweaked it by switching out the coffee table and painting it mustard yellow, creating a set of eclectic dining chairs, and swapping the tablecloth for a fringed burlap runner. 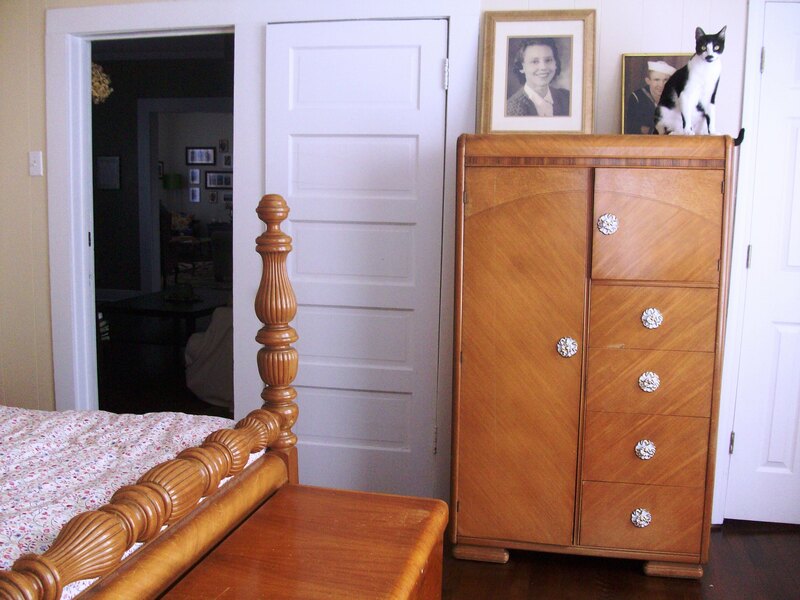 There are lots of smaller projects in here as well, like the paper garland on the dresser, the fabric flower pillow I made using a brooch that I wore with my wedding dress, and the acorn silhouette I made just last week. 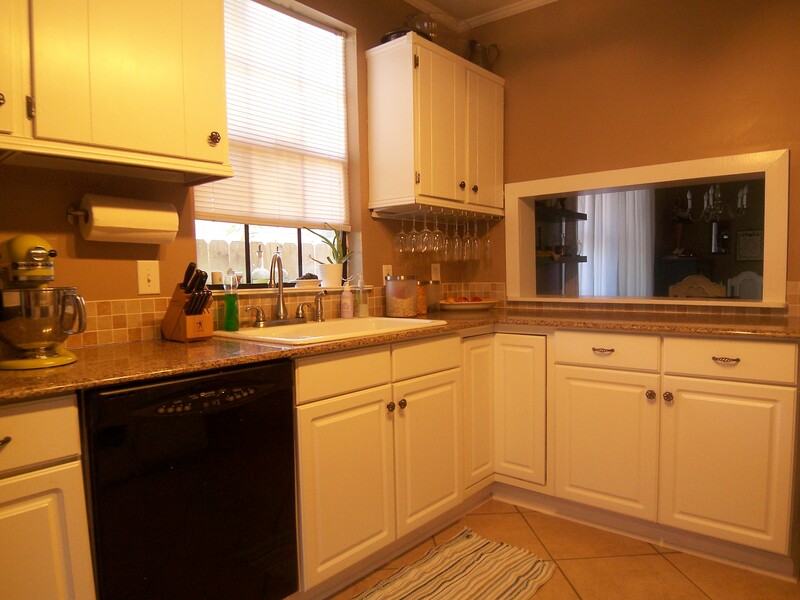 The kitchen is woefully stagnant. 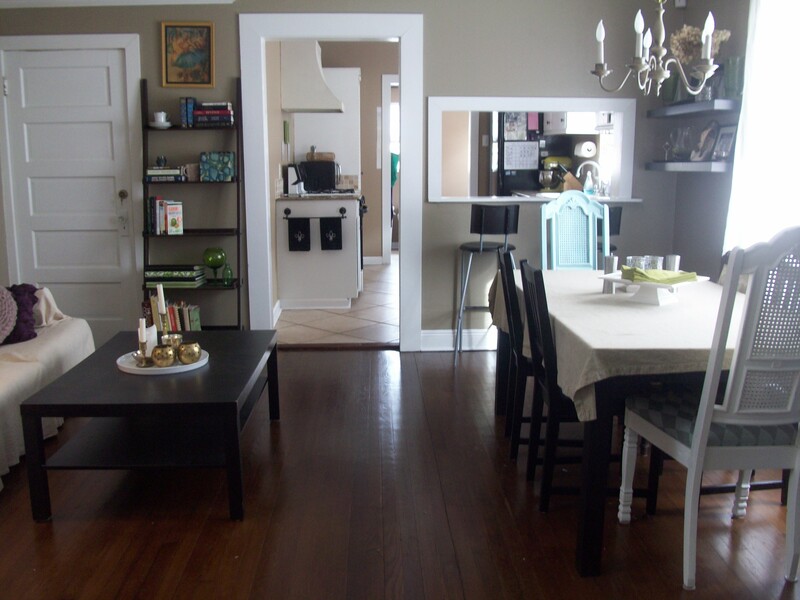 Nothing has changed at all, but I’ve got big plans for this space, like painting over the fleshy beige, adding some upper cabinets on either side of the stove, and opening up that awkward pass-through to create a casual eating area. 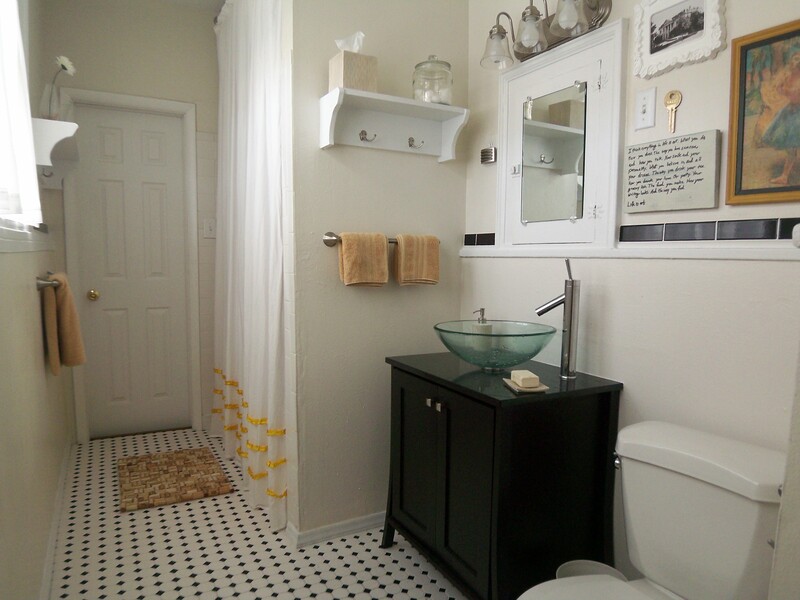 I just gotta save up some moolah, which isn’t easy when I’m always blowing through my monthly home improvement budget to fund more projects to blog about. 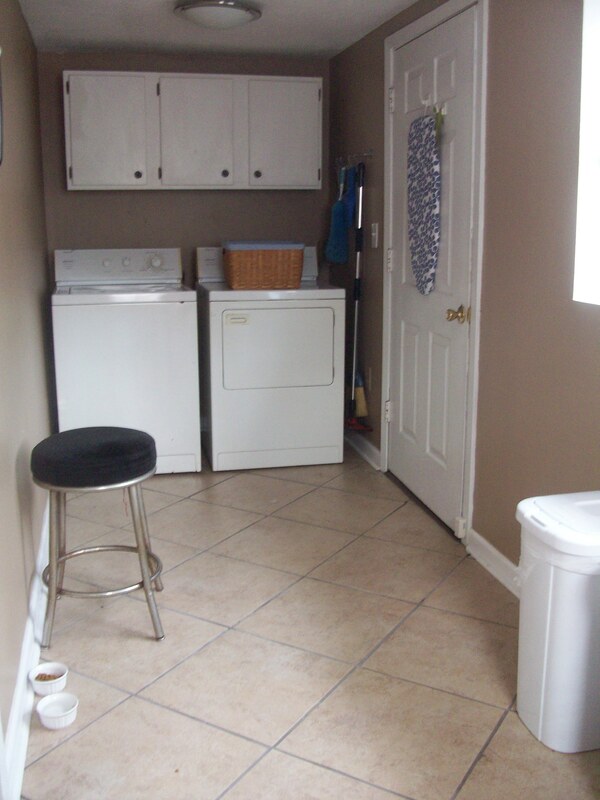 The laundry room was so sad before I started blogging that I didn’t even include it in the original house tour. 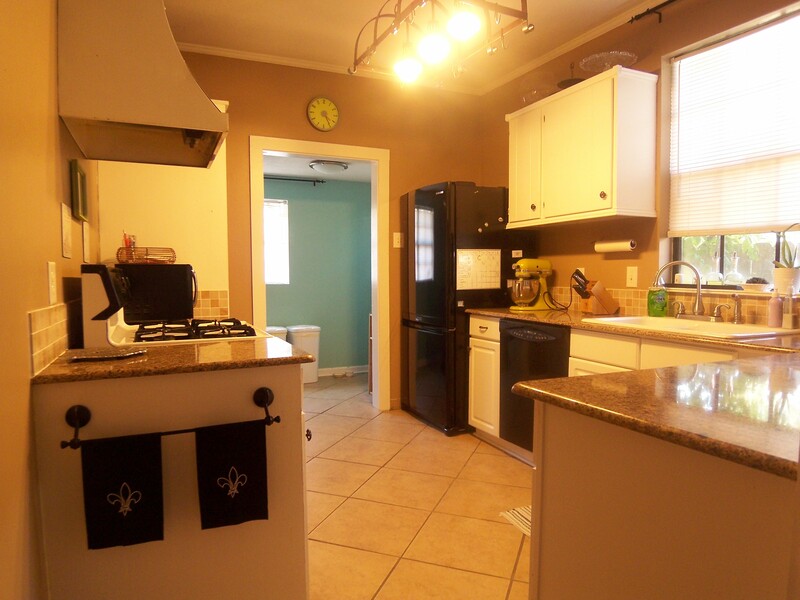 But Nick and I painted it blue and switched out those awkward cabinets for some open shelving that spans the full width of the space, adding tons of personality and function. 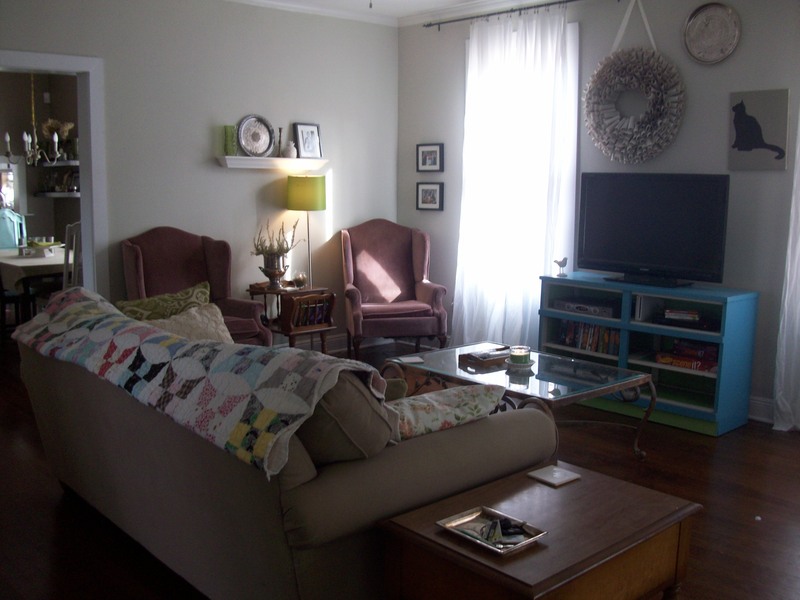 Upstairs, in the master bedroom, we got new bedding, reupholstered the hope chest, painted the armoire and chest of drawers, made a little chalkboard message area, put curtains on the fifty billion windows, added flair with some homemade throw pillows, and brought in some art. I’ve been a busy lady these last seven months! I just can’t believe how quickly things have changed. The whole house just has so much more personality now. A few years ago, I couldn’t have cared less about home decor. But something about having a house awakened the creative bug in me and I’ve had so much fun discovering and refining my personal style (luckily I had a rental house to practice on first–imagine lime green bedroom walls and all my stuff from college. I’m glad those days are behind me). 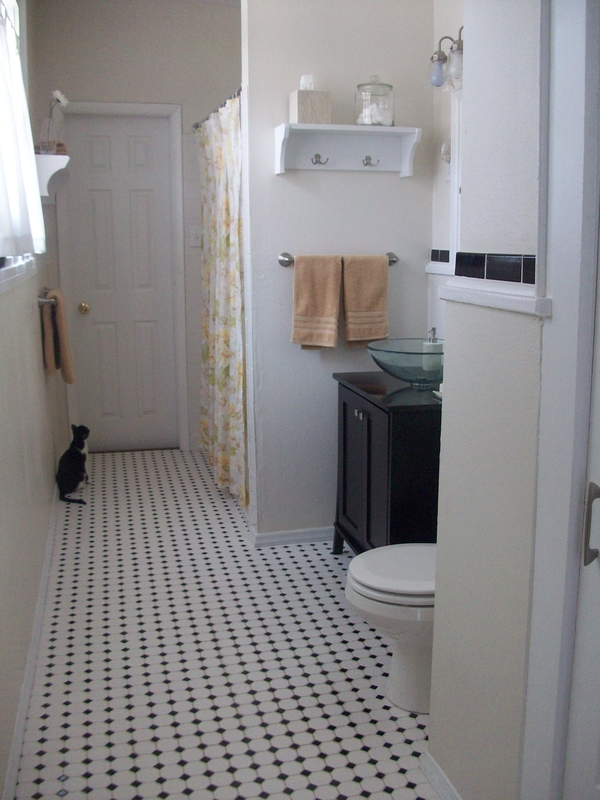 I’m sooooo excited to see what the house looks like six months from now. Maybe I’ll finally have saved up enough dough for some upgrades in the kitchen? 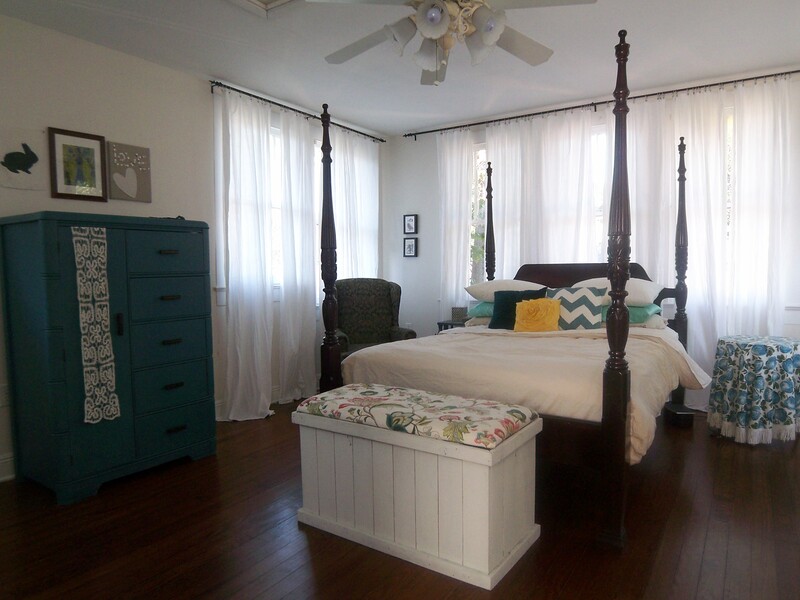 Or be decorating a nursery (for the child I have yet to conceive)? Only time will tell, but you can bet I’ll be blogging about it. P.S. 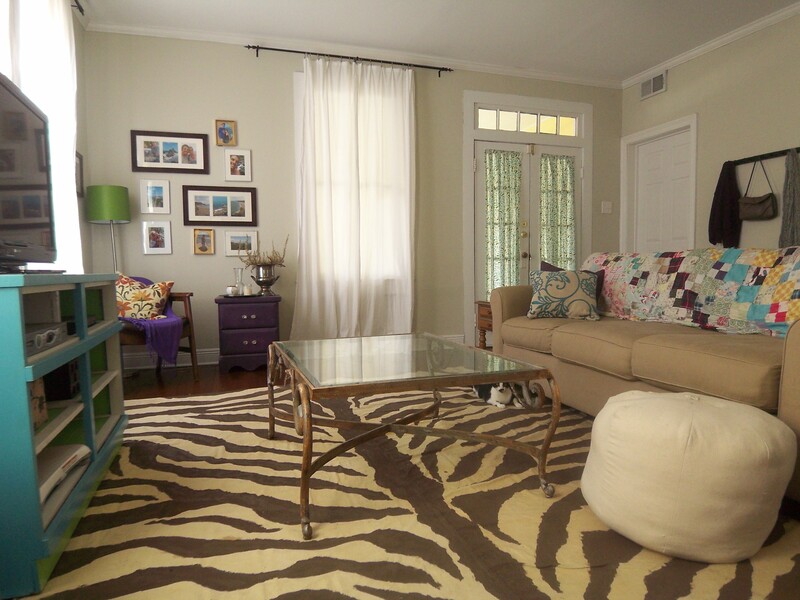 check out the house tour page for more pics of each room!